Kroll Show is an American sketch comedy television series created by and starring comedian Nick Kroll. John Levenstein and Jonathan Krisel served as the show's executive producers. The series premiered on January 16, 2013 and ended on March 24, 2015, on the American cable television network Comedy Central. Kroll Show is a social satire that parodies many aspects of television, the internet, and popular culture. The opening title credits of each episode feature multiple iterations of the show's title as parodies of well-known TV series title cards, brand names, corporate logos, and real-world locations, among them Absolut Vodka, Breaking Bad, Google, In-N-Out Burger, NASCAR and Game of Thrones. The style of the series is heavily influenced by the reality television genre, although it differs in style and content from other "mockumentary"-style series like The Office. Most sketches are written, performed, recorded, and edited to mimic the frenetic pace and melodramatic style of reality TV shows like Duck Dynasty, The Osbournes, and Keeping Up With The Kardashians, with multiple hand-held cameras, rapid editing, flashbacks, cutaway commentaries, and superimposed graphics and text. Each episode is constructed to simulate the effect of "channel surfing" across a range of reality TV shows on cable TV. An exception to the prevailing style of the series is the recurring sketch "Wheels, Ontario", which parodies earnest issues-based teen dramas such as Degrassi Junior High. Most sketches in the series feature Nick Kroll, who plays multiple characters, including dysfunctional teenage dad C-Czar, aspiring entrepreneur and "ghost-bouncer" Bobby Bottleservice, inept publicity agent Liz G. (co-founder of Hollywood PR firm "PubLizity"), celebrity pet plastic surgeon Dr. Armond, aging prankster Gil Faizon ("Too Much Tuna", "The Oh, Hello Show"), nouveau riche party boy Aspen Bruckenheimer ("Rich Dicks"), Philadelphia-based pawn shop owner Murph ("Pawnsylvania"), and Canadian teen actor-musician Bryan La Croix ("Wheels, Ontario"). Kroll Show completed its third and final season in 2015. 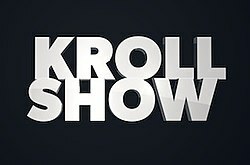 Kroll has remarked that the decision to end the show was his, and that the show's stories and characters were naturally wrapping up in the third season. Nick Kroll as various characters. Guest appearances have included: Nathan Fillion, Zach Galifianakis, Brody Stevens, Amy Poehler, Laura Dern, Will Forte, Jordan Peele, Bruce McCulloch, Brie Larson, Fred Armisen, Andrew Daly, JB Smoove, Hannibal Buress, Pete Holmes, Ike Barinholtz, Rance Howard, Tim Heidecker, Ed Helms, Maria Bamford, Brian Stack, Nathan Fielder, Richard Kind, Brian Huskey, Dave Holmes, Rob Huebel, Joe Mande, Adam Pally, June Diane Raphael, Paul Scheer, Casey Wilson, Jane Levy, Marc Evan Jackson, Katy Perry, Makayla Lysiak, Jon Heder, Henry Rollins, Seth Rogen, and James Franco. Sketches include: "Drones", "Fabrice Fabrice," "Pony Tales," "Can I Finish? ", "Armond About Town," and "Electricity." ^ a b "Oh Hello! Behold The Many Faces Of Nick Kroll "Kroll Show" Premieres On Wednesday, January 16 At 10:30 p.m." Comedy Central. Retrieved December 13, 2012. ^ "Kroll Show premiers Wednesday, January 16th". Kroll Show Tumblr. Retrieved January 21, 2013. ^ Owen, Rob (January 12, 2013). "Tuned In in Hollywood: 'Kroll' takes clever approach". Pittsburgh Post-Gazette. Retrieved January 21, 2013. ^ Fox, Jesse David (December 2, 2014). "Kroll Show Is Ending; Nick Kroll Explains Why". New York. Retrieved December 2, 2014. ^ "Wednesday's Cable Ratings: "Moonshiners" Holds Off "American Horror Story" Finale". The Futon Critic. Retrieved January 28, 2013. ^ "Wednesday's Cable Ratings: Season High for "Moonshiners" Puts Discovery on Top". The Futon Critic. Retrieved January 31, 2013. ^ "Wednesday's Cable Ratings: "Moonshiners" Goes Out on Top for Discovery". The Futon Critic. Retrieved February 15, 2013. ^ "Wednesday's Cable Ratings: "Duck Dynasty" Trumps Cable, Broadcast in Return". the Futon Critic. Retrieved March 1, 2013. ^ "Wednesday's Cable Ratings: "Duck Dynasty" Still Big for A&E". the Futon Critic. Retrieved March 8, 2013. ^ Kondolojy, Amanda (January 15, 2014). "Tuesday Cable Ratings: 'Being Mary Jane' Wins Night + 'Pretty Little Liars', 'Moonshiners', 'Justified' & More". TV by the Numbers. ^ Yanan, Travis (January 23, 2014). "Tuesday's Cable Ratings & Broadcast Finals: "Chicago Fire," "Biggest Loser" Top List of Originals". The Futon Critic. ^ Yanan, Travis (January 29, 2014). "Tuesday's Cable Ratings & Broadcast Finals: NBC News, "Biggest Loser" Top Charts". The Futon Critic. ^ Yanan, Travis (February 5, 2014). "Tuesday's Cable Ratings & Broadcast Finals: Top Viewers, Demos Belong to "NCIS"". The Futon Critic. ^ Yanan, Travis (February 12, 2014). "Tuesday's Cable Ratings & Broadcast Finals: NBC Stays in Front with Winter Games". The Futon Critic. ^ Bibel, Sara (February 20, 2014). "Tuesday Cable Ratings: 'Teen Mom 2' Wins Night, 'Being Mary Jane', 'Pretty Little Liars', 'The Haves & the Have Nots', 'Cougar Town' & More". TV by the Numbers. Retrieved February 20, 2014. ^ Kondolojy, Amanda (March 12, 2014). "Tuesday Cable Ratings: 'Teen Mom 2' Wins Night + 'The Game', 'The Haves and the Have Nots', 'Rizzoli & Isles' & More". TV by the Numbers. Retrieved March 12, 2014.